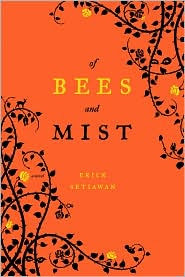 "Reminiscent of Keith Donohue's 'The Stolen Child', Erick Setiawan's richly atmospheric debut is a beautiful, engrossing fable of three generations of women in two families; their destructive jealousies, their loves and losses, their sacrifices and deeply rooted deceptions, and their triumphs. Of Bees and Mist is the tale of Meridia -- raised in a sepulchral house where ghosts dwell in mirrors, she spends her childhood feeling neglected and invisible. Every evening her father vanishes inside a blue mist without so much as an explanation, and her mother spends her days venomously beheading cauliflowers in the kitchen. At sixteen, desperate to escape, Meridia marries a tenderhearted young man and moves into his seemingly warm and charming family home. Little does she suspect that his parents are harboring secrets of their own. There is a grave hidden in the garden. There are two sisters groomed from birth to despise each other. And there is Eva, the formidable matriarch whose grievances swarm the air like an army of bees. In this haunting story, Setiawan takes Meridia on a tumultuous ride of hope and heartbreak as she struggles to keep her young family together and discovers long-kept secrets about her own past as well as the shocking truths about her husband's family. Readers of magic-realist fiction will instantly be captivated by this richly evocative fairy tale. Of Bees and Mist takes place in a nameless town during a timeless era, where spirits and spells, witchcraft and demons, ghosts and clairvoyance -- both real and imagined -- are an everyday reality. Setiawan skillfully blends the real and the fantastical as he follows our heroine over a 30-year time span in which her love, courage, and sanity are tested to the limit." Despite my initial resistance, the mysticism of the story captured my interest and pulled me into its magic. The story begins in a shroud of ghosts and unexplained extraordinary circumstances that made it difficult to understand the reality of what the author was trying to convey. Allegorical, metaphorical, symbolic, magical, ethereal.. I was so confused that I almost lost patience with it. I persevered, and as the coming of age story unfolded I was glad I did. I think this is one of those books that you would either really enjoy it, or just not get it, and therefore not like it all. You definitely need to shred the staunch disbeliever attitude and put on your imaginative and cognitive mask. Some readers may shrink away from a story which is so centered around paranormal things and meant to be read as a fable, which I was leaning towards, but the prose of this novel was so captivating that it was really a magical treat to behold. The darkness of events of the main characters would chill you to the bone, but in a thrilling nature as you try to unwind the mysteries behind these haunting characters. This is a family saga of which two families are pitted against each other and how they attempt to come to terms with it. It addresses the relationships between a husband and a wife, mother and child, sister to sister, etc. Each family member is fraught with their own flaws and it is interesting to watch them develop throughout the story. Meridia is a child of Ravenna and Gabriel, who are parents in no sense of the word. Ravenna is lost in a cloud of forgetfulness that she is barely a shadow of a mother to Meridia, and Gabriel seemingly could care less about anyone but himself as mists carry him from the house and back between the days. There are few words spoken, and Meridia is brought up by a nurse until she disappears suddenly. When Meridia goes to school and finally befriends Hannah, the reader is left to wonder if Hannah is even real. Meridia struggles to find the truth behind her existence, the reasoning behind the strangeness of her family and does not get very far with her conclusions as she itches for a way out of the madness of her house and family. Finally Meridia marries and is thrown into another familial relationship with her in-laws that is not an opportunity for the better. Here we are introduced to the mother-in-law Eva, her incessant grating chatter which are bees pecking and flying about, and the father-in-law Elias who Meridia could not tell if he is someone to be trusted. Meridia finds even more fantastic stories in this house, and wonders if her husband could choose between his mother or his wife. The magical elements create the symbolic tone, and their relationship to the realities of a modern day struggle between love, family members and the relationships which we create with each other. The women of the story seem to create a war with each other even as the men of the story try to throw their own weight around. I enjoyed the unique storytelling behind this novel, and it was truly an imaginative debut novel that I could hardly find any fault with the authors imaginary process. Although the rough start almost had me fooled, I highly recommend this novel to anyone interested in the nature of the family relationship with a surreal twist. This is a novel that can keep you engrossed for hours because of the complexity of the characters, and there is always some sort of mystery going on. The metaphors and symbolism intertwined with the magic forces make this a gratifying read.